LEOPOLD KNEBEL, one of the largest landowners in the State of Illinois, and a well-known grain buyer at Pierron, is the subject of this present writing. He began the battle of life a fatherless boy at sixteen, and by the sterling traits in his character, has conquered all difficulties, and now is wealthy and respected. The gentleman of whom we write was born in Baden, Germany, November 27, 1839, a son of Sebastian Knebel, who was also a native of Baden. Before coming to America, our subject had the advantage of six months of schooling in Germany, but in 1847, he, with his parents and four other children, started for the New World. The ocean trip was long and tiresome, taking fifty-six days to accomplish, and when the passengers were landed in New Orleans, they still had an eight-day voyage between them and St. Louis, on the way to their destination in Madison County, Ill. 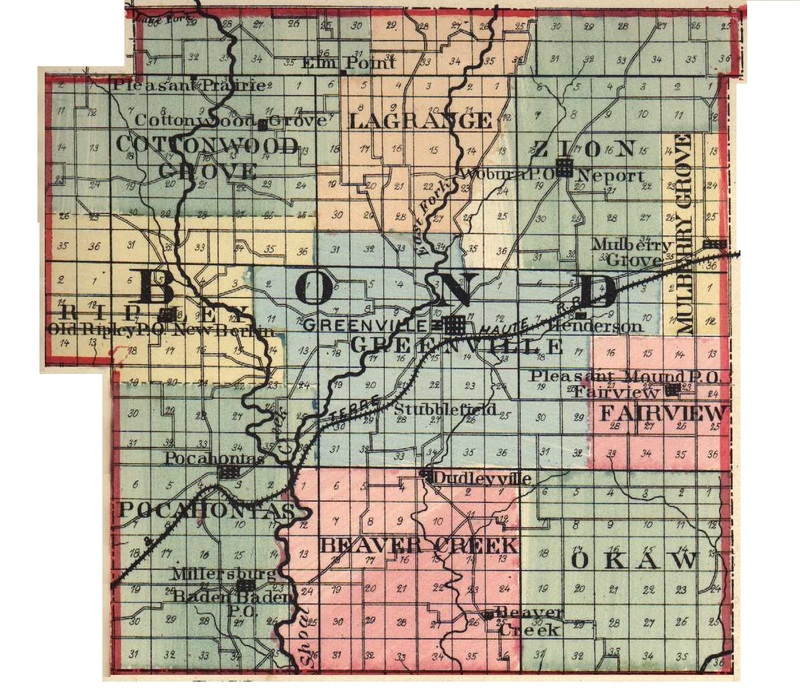 Upon reaching Southern Illinois, Mr. Knebel bought land in township 5, range 8, Madison County, selecting one hundred and forty acres on the edge of some timber. Of course the educational advantages to be secured in such a place were not very extensive, but our subject attended the subscription schools, then held in the log schoolhouses, which were only supplied with slab benches and earthen floors, and absorbed as much learning as did his fellow-students, whose opportunities were the same, and many of whom had come from the same land across the sea. The father of our subject was removed by death when Leopold was only twelve years old, and the latter was obliged to think of some way in which he could obtain a livelihood. Labor he must, and so he hired out by the year, after having it put into the bond that he could have three months of schooling. For two years he worked for board and clothes, and at the expiration of that time he received from $5 to 17 per month for two years longer. By the time he was sixteen, he desired to become master of his own wages, so hired out and worked from that time until he was twenty years old for from $8 to $10 a month. When twenty years of age he had saved enough from his rather slender salary to purchase eighty acres of wild prairie land, and felt enough faith in the future to ask Miss Caroline Walter to become his wife. The wedding took place March 3, 1862. She had had a trying experience on her way to America from her native place, Baden. The year of her departure was 1854, and at that time the same dread disease which of late has hung along our shores, the cholera, was raging along the Mississippi. After a long trip of forty-eight days on the ocean, the passengers took the boat to ascend the Mississippi from New Orleans to St. Louis, and forty-eight of the passengers died on that boat. Water was low, and four weeks were consumed upon that passage up the river. She was accompanied by her parents and her seven brothers and sisters. The children born to Mr. and Mrs. Knebel are Julia, Carolina, Ida, Edward L., William and Henry. Our subject settled on his farm in Madison County, and now has twenty-one hundred and fifty acres, all of which he has improved, with the exception of thirty acres of timber. He has owned more land than this, but has sold part of it off in lots. His income from his land now is from $5,000 to $7,000 a year. One branch of his business is the buying and shipping of cattle and hogs to all points. He buys all of his grain at this point, and has an interest in the elevator with Charles Speckart, who is his son-in-law. His farming does not trouble him much, as he rents out about all of his land, but the time has been when he was a hardworking man, and it has been on account of his good management and industry that he now occupies the position that he does. Mr. and Mrs. Knebel are members of the Roman Catholic Church, and to it he gives liberally of his means. In his political opinions our subject is a Democrat, although he voted for Lincoln because he was opposed to slavery, as at that time that was the principal question of dispute. He also voted for Grant when he ran for President the first time. Since then other questions have come up upon which Mr. Knebel thinks the Democratic party takes the proper stand. He has been a delegate to both county and Congressional conventions. Mr. Knebel has seen about all of the advancement of this section. He hauled the first load of lumber for the beginning of the present town of Pierron, and built the first building on this site. His acquaintance is large, and he is regarded with respect as a man of sterling worth. Extracted 04 Dec 2016 by Norma Hass from 1892 Portrait and Biographical Record of Montgomery and Bond Counties, Illinois, pages 200-201.